Andrea Brady was born in Philadelphia in 1974, and has lived in the UK since 1996. 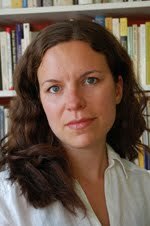 She is the director of the Archive of the Now (archiveofthenow.org), and co-publisher of Barque Press. Her publications include Vacation of a Lifetime (Salt, 2001) and Embrace (Object Permanence, 2005), as well as several chapbooks. She has performed throughout the UK, Europe and US. Widely published in small magazines, she was the focus of a special issue of Chicago Review (2007). She teaches Renaissance and contemporary literature at Queen Mary University of London. My first chapbook, Open Bond, was really a small collection of small poems, self-published with a cover which required an enormous amount of work (painting and gluing). It was a limited act of disclosure with no audience but marked some sort of excursion, symbolically at least. The next book, Liberties, was actually read by some people. It was my first grown-up poetic undertaking, a sequence, thoroughly revised into a consequent shape, and like my most recent work, combined my research interests in early modern writing with ethics, landscape, contemporary politics and love. Thinking = passion + spontaneous Anaxagoras. Did it change my life? I was both proud of and embarrassed by it. It seemed at least an accurate depiction of the puzzling condition of being young and in love in Cambridge. Stephen Rodefer tells me it was the best work I’ve done (still). There’s some recrimination in that, but I also recognise that, as Peter Manson says, the poems I write now will never mean as much to me as the ones I wrote when I was 20. I wrote my first poem when I was in first grade and it was non-fictional. The crazy Sister of St Joseph who taught us, Sr. Maureen, one of those guitar-playing breakout nuns, made us watch the news during class. The poem was in rhyming couplets, about the Lebanese hostage crisis. In addition to marking me out for a lifetime of writing political poetry, this was maybe an early indication that poetry could be used to organise and contain public events which were distressing and disorienting. It was also a prayer – and though I’ve given up on prayer these days, poetry may still fulfil a similar function, a space for reflection, penance, adoration, moved by inspiration or set form. My parents read us lots of verse – I am now reading to my own daughter out of the same books, with their incredibly evocative drawings: ‘show me the way to nowhere town’, with its enormous flooding sun whose yellow I can really smell. As I grew up I was drawn to the mysterious compaction of poetry to displace the blasted Catholicism. Dylan Thomas was a favourite in high school, along with the mystical Yeats. I remember performing ‘The Stolen Child’ and feeling, now that’s a real poem. My writing when I was at school combined longing with eucharistic metaphor and ill-informed jeremiads on Irish republicanism. I was in thrall to other people’s political convictions – anywhere I could scent a bit of rebellion. Mostly I wanted to escape. I remember as a child staring for hours at the inside of a box hedge which had been transformed into a kind of crystal ballroom by an ice storm; and also at planes lifting over the trees to go away and feeling like I was on drugs (not that I then knew what that felt like). The bounty of poetry seemed like an esoteric alternative to the narrowness and ignorance of my surroundings; a box filled with elsewhere. I usually work and rework my poems considerably, though the first drafts come quickly, often under compulsion. Hit by a sudden desire to be in the writing. Sometimes I have ideas for extended projects – more on that below – while other times, all I have is an itch that needs scratching. I used to incubate poems by going on incredibly long walks, in the way that ancient people incubated dreams in temples. The poem will incorporate the harvest of words from several weeks or months, words collected on the street and in conversation, but it erupts straight away. I am sad to recognise that as I get older these momentary eruptions, urges and desires come less frequently. My time and my thinking is so fragmented. I don’t write at work anymore; I work at work. I am happily settled in love so I don’t write those driven, manic, disguised love poems which are first of all acts of persuasion anymore either. I have tried to respond to my decadence by working on longer projects, such as the verse essay Wildfire. A bit of both. Wildfire was a coherent project, which I began while I was on sabbatical, researched in the library, and treated as a job. The poems in another manuscript I finished last year, The Rushes, are more occasional. Once I have assembled them all I go back and shape them into complementarity. At first I didn’t allow public performance to shape my practice. I subscribed to the view that the poems were written first for the experience of private reading, in silent communion with the page. The reading let loose free radicals of phrase and image which could, at best, pinch the audience’s curiosity, and get them to pick up the book, at worst cascade over them in oblivion. As a result I think I was an effective, a professional, reader but not an inspiring one. When I read alongside very accomplished readers, whose writing was funny or entertaining or open in a different way to the compressed interiorities of my own poetry, I could feel the room deflate. But I think that recently, the experience of reading – along with the experience of writing to and about my child – has very much changed my writing practice. I have given eight or nine readings since she was born. I hadn’t been writing much other than notes and observations and the occasional poem during my maternity leave – no time, no mind. These notes were something I had intended to go back to and work into a ‘real poem’. But life leaves you behind, and there was barely enough room to catch up with who she was from day to day. So I was left with these scrabbled, sentimental and profoundly open notes. I hadn’t written them to be public; but I also didn’t want to parenthesise that time and that writing, and resume where I’d left off, in my thigh-high theory boots and stark professionality. So I began reading these baby-texts. It forced me to make myself vulnerable to certain perceptions – or rather, to understanding, full stop. I’m not sure that the texts are a success or even finished but what this has taught me is that obscurity can be a kind of defensiveness. I am wary now about writing poems in order to elude the accountability which an essay entails. I want to become a better performer, and I can feel myself writing poems to be read aloud, which have enough range and interest to compel me to read them actively – without sinking into that deadly poetry-voice, the dirgy sing-song sameness that shines like a dry veneer of profundity on the surface of an impenetrable text. I’m not quite there yet but I hope I’m getting better, less boring. This is a massive question which I’m not sure I could answer in an interesting way. My poetry is informed in its confrontation with alienation and the violence of neo-liberal capitalism by a long engagement with critical theory. I think you know who I’m talking about. I’m also aware of the need to justify poetry as a form of political activity – coteries which displace other kinds of political organising. Nonetheless the fact that poetry audiences often conist of poetry producers is not a sign, I think, of the redundancy of the experimental tradition, but rather a confirmation of its liberatory ethos: once you’ve read this work, you become inspired and enabled to write some of it yourself. To take on the responsibility and the mechanisms. I think much more needs to be done to think through the production of readers (by that I specifically do NOT mean the development of markets), and the relation between poetry organisations and political ones. For example, the conventional reading format can be extremely formal and restrained, a secularization of the Sunday service, with a passive audience receiving without question the holy word. Or it can be chummy: the reading is just a reunion with poetry friends. There’s nothing wrong with that; some of my best friends are poets. But we think rather too individualistically about reading, if we’re the performer – I want to get this work across to people – and not enough about what we want as audiences to get out of poetry readings. Inspiration? Frustration? Confusion? The chat and the pint of beer when it’s been sat through? Or something else? 7 - What do you see the current role of the writer being in larger culture? Does s/he even have one? What do you think the role of the writer should be? Another enormous question. The writer is not gifted with any particular role or relevance, but poets with even the slightest sense of responsibility should feel obliged to fashion a role for themselves, not as ethical arbiters but as porters for the mirror which language holds up to power. They should be as ambitious as Ben Jonson, but not as murderous. Then they should expect to be ignored (at worst) or ridiculed (at best). As Charles Bernstein reminded me once, when I was up to my ankles in my dissertation (on early modern elegy), don’t mourn: organise. I am lucky or unlucky enough not to have been subject to much editorial intervention. Most of the editors who have published my work subscribe to the all-or-nothing school: the poem is either accepted or rejected. If it is accepted, there is sufficient respect for the mysterious logic of the poem that the editor will not suggest alterations. As an editor myself, of the small press Barque, I have only once made an editorial suggestion, and that was to ensure that a poet didn’t wreck the reception of his book by including a pointless and cheap slur on another poet. I wouldn’t otherwise feel qualified to intervene in the poet’s writing process. You need to be very thickly engaged with the muck of the working, down in the mire, in the word-choice and the associative logic and unaccountable intentions of the poem, before you can begin to see why x is better than y.
Kenneth Koch, when I was working for him and being taught by him at Columbia, tried to make me understand how serious poetry is light-hearted. I wasn’t entirely ready to know that at the time – the most recent poetry I knew at that point was Eliot, and I saw his advice as the product of a lifetime swimming in exorbitant grants, aestheticizing women and Europe, the kind of life no one of my generation could have without trustfund and a blindside – but I have since begun to understand that profundity is not the slave of darkness. I will never look at a field full of women picking crops in Madagascar and think they could have been choreographed by Balanchine, however. Is there an appeal to critical prose? Please see Tom Raworth’s poem ‘University Days’. Its production is a job requirement. Some literary criticism can be enlightening, but as a genre it is rarely exciting: it’s bizarre then to dedicate my energies to writing in a form whose greatest exponents I could barely list on one hand. Contemporary poetry can do with criticism, I think; the criticism can provide hand-holds for difficult ascents, as well as shape the writer’s own development, maybe for the better. But as I look at the hundreds of pages of reviews of recent books in Renaissance Quarterly I’m not so sure that we really need this army of scholars re-occupying the territory which an older generation (which could at least read Latin and Greek) excavated so thoroughly. Perhaps part of the problem is that literary criticism is not the place, unless you are spectacularly unusual, to announce the discovery of interesting big ideas. I have no routine for writing – my routine is just to keep the house and the job going, and poetry must find a way to slip unnoticed in the joins. I work best in the morning, with quiet and a view of green. I am often provoked to write by jealousy (as admiration): hearing or reading a great poem makes me wonder where I could go with the same energy. John Wilkinson’s poetry often has that effect. Always other poets, from my contemporaries through to classical antiquity. Philosophy. Cinema. Fiction and the newspapers. The industrialized pastoral of the Lea River valley. Through the covered bridge onto the Wissahickon bridal path. Reading the blogs and the magazines, find out what the young poets are doing these days. Downtown. On a dérive around the East End. Tea and cake. The park with Ayla, the beach with Ayla, the anywhere with Ayla. To certain galleries, usually ending in 1950. Uphill. To bed. 13 - If there was a fire, what's the first thing you'd grab? After the children, a bathrobe and a pair of sensible shoes? A folder of home videos, the box of love letters. Actually I often dream of a fire: of being compelled to start again with nothing, of being mobilized by freedom from objects. Moving house, packing up our library, is an object (abject) lesson in how buying books substitutes for their reading them. The amount of unexamined treasures we own is really obscene – almost as obscene as fantasizing about having nothing. I’ve recently been writing a series of poems inspired by the photomontages of Hannah Höch. In the past I wrote a poem, ‘Sweatbox’, which was inspired by Gilgamesh and the Sumerian collections at the British Museum. The last art work that really affected me was Picasso’s studies of Las Meninas and the collection of artworks belonging to Antonio Tapies in Barcelona. But to talk about all the artists, composers, scientists and naturalists I admire would take all day. Someday I fantasise about being as capable of minute observation as R. F. Langley, either of the natural or the artificial world. That bit in his Journals where he describes what happens to animal behaviour when you have stood perfectly still for three hours is extraordinary. So many – all of them. Donne, Marx, Wieners, Benjamin, Guest, Milton, Raworth, Shakespeare, Spenser, Niedecker, Katherine Philips, John Wilkinson, Hobbes, Campion, Prynne, Rabelais, George Eliot, Raleigh, Crashaw, Ed Dorn, Wordsworth, Keston Sutherland, Peter Manson, Lisa Robertson, Brecht, Clare, Ishiguro, Henry King, Henry Vaughan, Henry Green, Thomas Browne, Adorno, Beckett, de Bord, Novalis, Kafka, Oppen, Mary Wroth, Bourdieu, Bill Fuller, Pound, Ted Berrigan, W. S. Graham, Olson, Proust, Frank O’Hara. Really I shouldn’t have begun this list, everything belongs on it. Oh lord. Learn to speak another language fluently. Live in all the other places. Walk the Inca trail. Learn how to use f-stops. Play a musical instrument. Have another baby. Introduce the national media to a rigorous and accountable language for the discussion of poetry. Reconcile my extended family. Read all the foundational texts of German idealism. Feel confident swimming long distances in the open ocean. But – breath. A friend gave me a Christmas card this year, which said on the front, ‘NOW / REST’. That must be the most important thing I haven’t yet learned how to do. I keep thinking about retraining as an anthropologist. I’ve made use of anthropological theory in much of my critical work. Really I feel I should have done something which engaged me more in development, either working in the field, or advocating at home. I know that there are lots of exceptions to be made to the idea of that kind of work by people who actually do it, but I feel like I grew up with a very limited exposure to the kinds of work that can be done, so I just drifted into academia somewhat automatically, from a lack of creativity. Writing of course is not my primary occupation. As a modern academic I have a desk job, lots of data-entry, form-filling, report-writing, from which I sometimes slip away to do some teaching. This work is incredibly complex – you’ve got to be skilled in delivering presentations to small and large groups, designing learning programmes and grant applications, assessing learning, managing group dynamics, researching at the forefront of your discipline, supervising others, offering emotional and professional support to students with incredibly complex and varied needs. In the middle of which, the space for creativity, independence and curiosity is constantly shrinking. What I really want to do is read and write poetry and write books with big ideas in them. My job is somewhat opposed to that possibility. All That Fall by Samuel Beckett. Middleton’s ‘The Ghost of Lucrece’ and The Witch of Edmonton by Rowley, Dekker and Ford. Bacon’s New Atlantis and Abiezer Coppe’s A Fiery Flying Roll. Zukofsky’s ‘A’, Basil Bunting’s ‘Briggflatts’ and Wieners’ A Book from Rome. The Holy Mountain by Jodorowsky, Pickpocket by Bresson, and Antichrist by von Trier. I’ve got a semester off, and the summer to look forward to, so I am working on a research project on physicality and embodiment in early modern poetry; I’m also thinking through and working on my project on infancy, working title = The Breathing Frame. I’ve been writing some landscape poems, and I’ve got a shorter poem on Blackwater I want to develop, for which I am possibly going to do some reconnoitring in North Carolina this summer. I’ve got papers to write on contemporary poetry, intimacy, and address (the blinking ‘I’). Longer term I want to write a poem-essay on food, and a book on the history of doubt.